The Bee Man offers Coto De Caza bee removal to residence and businesses on a 24/7 basis. 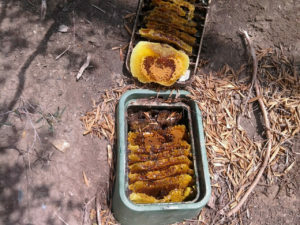 The natural terrain in the Coto De Caza area is an ideal location for feral honeybees to create hives. The most common areas are here. However, bee swarms and scout bees are also a common site in the area. There is a lot of concern about the bee population in Orange County. First of all, it is important to note that feral honeybees are very common and far from extinction. There are three different varieties of feral honeybees. The most common is the European honeybee. Another type is the Africanized honeybee. Finally, there is a “hybrid” honeybee. The European honeybee is the less aggressive variety. Typically, they have smaller colonies. Consequently, they will only send out a few hundred bees to chase off any intruder who gets too close to their hive. The European honeybee makes up about 37% of the Orange County feral honeybee population. European honeybees do not pose as dangerous of a threat as the Africanized honeybee. The Africanized honeybee is also known as a “killer bee.” In contrast to the European honeybee, these bees will protect their hive with a massive vengeance. They will send out thousands of bees to “eliminate” any nearby intruder. The Africanized honeybee can kill small animals and pose a serious threat to humans. They spawn a queen twice as fast as their European cousins. They also create twice as much honey. Their hives can cause serious property damage. It is nearly impossible to tell the difference between a European honeybee and an Africanized honeybee. As a result, we strongly advise that you do not attempt to remove any bee infestation yourself. The hybrid feral honeybee is just that. A combination of European and Africanized honeybees. Making about 60 percent of the population, the hybrid feral honeybees are less dangerous than Africanized honeybees. As a result, we strongly encourage you to not disturb any bee infestation and call us. The Bee Man offers professional bee removal services to residents and commercial customers 24/7. Above all, we advise not disturbing any bee infestation. Also, for your protection, please refer to our safety tips here. Finally, if you need any Coto De Caza bee removal, please contact The Bee Man at (949) 455-0123 before any property damage occurs.